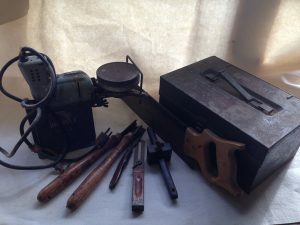 Most of my accumulation are well-loved legacy tools from the busy shops of my grandfather, father, our family farm, my father-in-law, an uncle-in-law, a brother-in-law, and two older friends with whom I shared a project or two and the passion for design/build years ago. Some of the tools even came from two of my sons, cast-off tools they no longer need or already replaced with a must-have newer model. 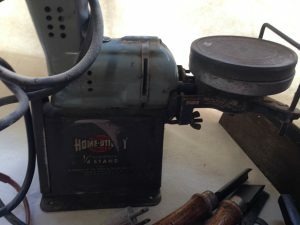 Many others came from the irresistible “bargain-shelf” marked-down jumble of inexpensive tools that my father or others were unable to pass by without purchasing on their way to the cash register with the item they originally went in to buy. One of my favorite antique treasures is my father’s first ¼” electric drill from either the late 40’s or early 50’s which survives in working order with its complete kit of honing wheel, stand, and an assortment of accessories. Others of my legacy tools — a working 1940’s 10” bandsaw from Homecraft, a reciprocating cast-iron jigsaw, and many assorted chisels, planes, saws, and scribes – all deserve better than the metal shelving storage in the dark back corner of the shop where I keep them – just in case. 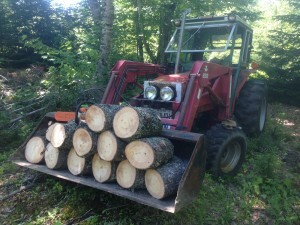 Using these older tools has the benefit of reminding me of their original owners, and occasionally they have just the right feature for a special job, reinvigorating their value. But the reality is that they take up a great deal of space, have worn electric cords and ancient heavy motors, work inefficiently, and have long ago earned a more dignified retirement. 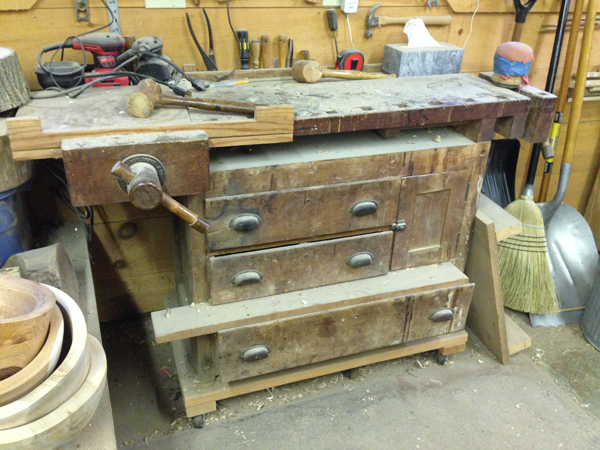 Like the ever-growing pile of “valuable” future turning blanks (the logs out in front of my shop) that I am destined to leave as part of my legacy one day, the assortment of old tools needs to be addressed. One way I decided to address these is to build a wish list of the selected tools that I have the greatest use of and replace them with new, modern, precise, and fully functional upgrades. 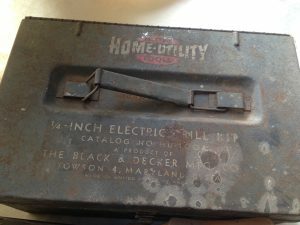 For example, I have an old set of Milwaukee drill/drivers from the mid-1990’s that my son gave me when the first set of batteries wore out. I replaced those clunky and expensive batteries twice (amazing), and they now need to be charged frequently. The new Festool PDC 18/4 Quadrive Cordless Drill, perhaps even the Set, looks like it might be just the step in the right direction. It is lighter, stronger, more versatile, and has the new batteries that will last longer than I am likely to work in a day. I will put that high on the list because that is a universally desirable tool for many different applications. Given the steady dimming light of my aging eyes, the Magnetic Flexible Arm LED Work Light adds just the right note to my list. I am forever adjusting and adding clamp-on lights to whatever I am working on, and moving into the LED age offers many benefits – more light, less power, greater life. 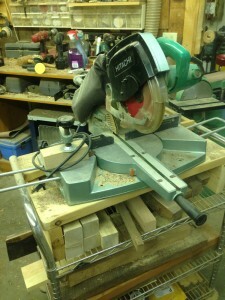 Although I already run a large Bridgewood dust collector in the shop (as a woodturner I have far more chips than dust) and a standard aging Jet ceiling filtration unit that I purchased in the late 1990’s, I am far more aware today of the dangers of accumulated dust throughout the shop and the challenge it poses to health and safety. 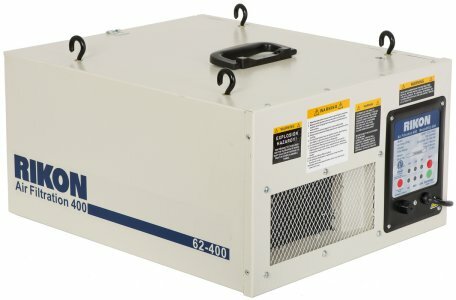 Adding a second Air Filtration Unit would make a great deal of sense, particularly given my regular parade of students in the shop and my own seven-day week there. Another old technology, from about 1994 if I recall correctly, is my old-model airshield face- protection, the one that had built-in triangular rechargeable batteries that are no longer available and no longer recharge. Because it was inefficient and battery life short-lived, I have used it in the past ten or so years. On one recent cedar porch-post turning job, I struggled with filtered facemasks, steamed-up glasses, and frustration. The newer Trend Airshield Pro would appear to be a prudent and valuable addition to my list that I can resolve to use. One tool that might be just for fun extremely helpful is the Air-Filled Cushion Contour Sander with sleeve assortments. I end up doing a great deal of repair sanding to various jobs, and from what I have read it fills a need. One other tool, often overlooked, that I do not need to put on my list is my primary workbench, an antique relic that my grandmother gave my grandfather in kit form as a wedding gift (did I ever tell you what a wonderfully insightful woman she was?). 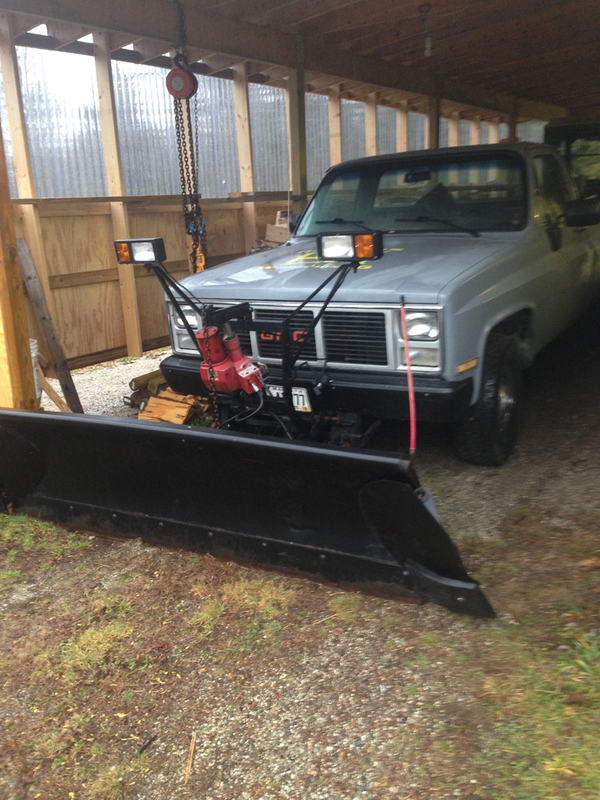 Pictured here, I use it regularly every day and appreciate its sturdy versatility and value. Ironically I inherited another identical one from my father-in-law that my oldest son spirited away to his loft shop at Brooklin Boatyard. Other than having to put it up on wheeled blocks to raise it to a more convenient height for my taller use, this bench has been through it all, and I plan to make special mention of it in my will for my grandson. The new high-quality benches are terrific, but I am not wooed from my old favorite in this case. Good tools with lasting value make a difference. In a world where too many things are used and discarded too easily, committing to buying the best of tools, like the best of materials, is the secret to demanding the best from yourself in your work. Life it far too short to use inferior tools or materials. Generating gifts for others on special occasions and holidays can be a challenge that offers endless opportunities for creativity and imagination while adding a tension of uncertainty that comes from trying to guess what will delight someone else on a specific occasion, particularly if you wish to make it. While I prefer to make gifts rather than purchase them (the Scot in me, perhaps), I also enjoy the process of thinking about what a recipient might like or need and typically hope to add an element of surprise and delight. Three of the people who are close to me present a particularly significant challenge because when I miss the mark, I can see that my gift is headed for the back shelf, re-gift drawer, or worse – a painful experience that I work hard to avoid. When I hit the mark with these folks, the gifting is particularly rewarding. One gifting effort that has been successful for me over the years is to make a puzzle or game to give as a gift. Doing this solves both the gifting desire while inviting others to either play the game or in the case of a puzzle to compete or contribute in attempts to solve it. When the recipient unwraps one of these gifts, there is a clear invitation to others to join in and play. 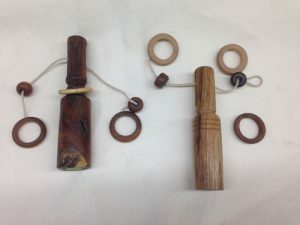 In October 2015, Highland Woodturner published my directions to make the fascinating Ring ‘n String turned puzzle (Issue #55). This delightful puzzle offers a significant challenge to many people, satisfaction to those who master its easy solution, and an opportunity for the turner to choose design and wood that make it a beautiful piece of artistic display. 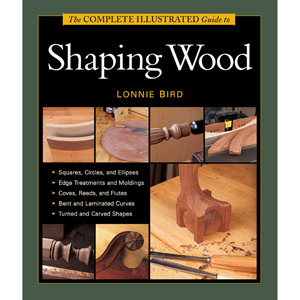 I will also rate it high as a woodturning skill-builder for the variety of spindle techniques and tools. 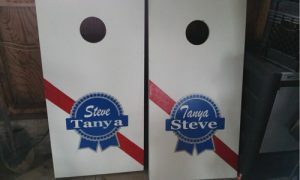 Another favorite gift-game that allows a broader sense of creativity and group fun is “Corn Hole” – popular especially with my sons and grandchildren. The photo at left is of a wedding gift set that my oldest son recently made for his friends Tanya and Steve, and it was well-used at their recent all-day field/tent based wedding reception. 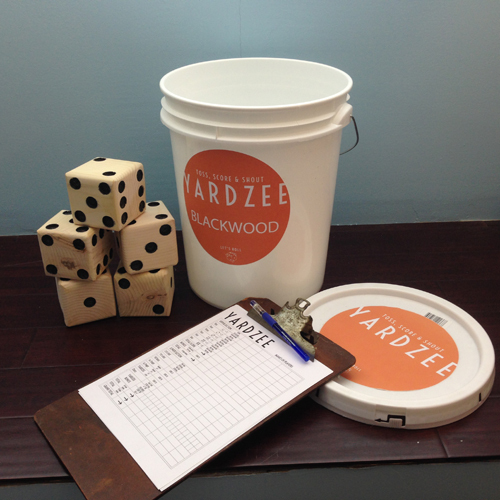 A similarly enjoyable and party-playable group yard game is “Yardzee,” a large-scale adaptation of the famous Yahtzee, a complex game of five dice that adds an element of strategy, tactics, and scoring similar to card games like poker and canasta. There are several excellent sources on-line for making a set for Yardzee that include printable templates for setting the dice holes and printing the graphics and scorecards. 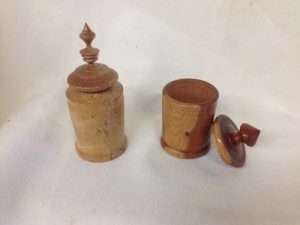 Not everyone is right for a puzzle or game gift, and because I am quite dedicated to woodturning, I have explored a wide variety of gifts over the years that seem to be gifts that people value and keep, my own criteria of success. 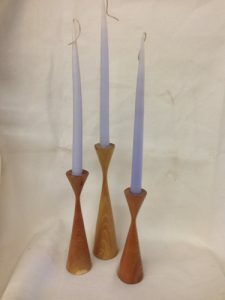 Blending beauty in color, texture, shape, and form with an utilitarian Osolnik design candlesticks, an admirably beautiful gift, challenges the many woodturners who struggle with the magic skew chisel. In stepped collections of three, five, or seven candlesticks of a naturally beautiful wood like black cherry, walnut, ash, or locust, this gift is a sure winner with every hostess and decorator because of the unique beauty of the wood used, the variety of arrangements that can be created with these as a core element, and the opportunity to match the wood with a limitless assortment of flavors and colors of wax candles. A similarly useful and potentially beautiful gift is a turned lidded box. Over the years, I have turned boxes for people in my life who have a treasured possession to care for, for a beautiful piece of wood/art that they can admire and use for different purposes, and once in a while to contain a letter, symbol, or gift certificate additional gift that was late being completed, too large to put in a box to wrap, and once for a wife’s surprise new-car key! The best part of these types of gifts is that they give many times – naturally at the time the gift is made, but also at the giver’s inspiration and personal reward designing, making, polishing, and anticipating the act of giving. 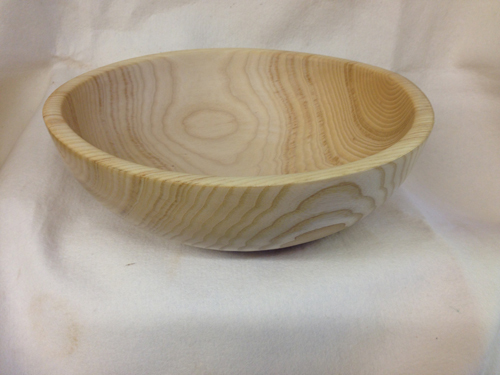 Another rewarding gift, reliable, useful, and potentially lovely is the gift of a hand-turned salad bowl of white ash. Like the earlier gift choices, this gift allows the turner to meditate on the recipient during the design and execution phase, anticipation during the drying and finishing phase, and deep shared pleasure when the gift is delivered and then put to use at a family or community meal. 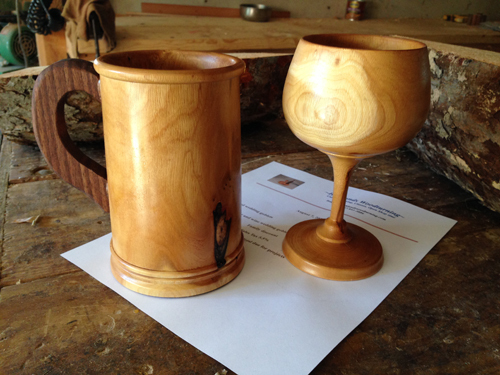 Last summer, my middle son asked me to make his friends a wedding present of a beer stein and wine goblet, which I did from some local apple wood I had on hand. This type of gift, like the other useful gifts that bring the warmth of wood to the deeper relationship of people, gives multiple times. While I do not know his friends, I do know he would only ask me to do so for special friends in his life. I was honored that he asked me to join their relationship that way, and perhaps at some point I will meet the newly joined couple. The task (fastening the handle was my challenge) was worthy, and I copied a pewter beer mug given to me by my father on my 21st birthday to make the beer mug look authentic. Somehow that seemed a significant recognition of this couple’s special anniversary day and my part in providing it. But all of this aside, I believe I am naturally biased toward gift giving (creation) above gift receiving. In this blog last December, I shared my most treasured gift, the “gift of time” in a blog entry called “Resolutions” which I will invite you to read and reflect upon. That gift succeeded with unexpected benefits and partners. I do, in fact, know what to gift more specifically this year as a follow-up and have already begun my preparations. A letter I have written to my son on his 39th birthday. As I prepare for your upcoming 39th birthday in the first month of the New Year, I hope you will remember many years ago when as a young teenager you so proudly gave me that beautiful wood and brass 4’ Level in the plastic case from Centerville Lumber Company that I had often looked at longingly. You know, the gift that the Lumber Company so kindly sent me a charge for $43.97 on my bill about a month later. Your mother and I engaged in some conversation about it and I paid up without a fuss. Your excitement over giving me “just the right gift” that I wanted badly but could not allow myself to buy made all the difference. 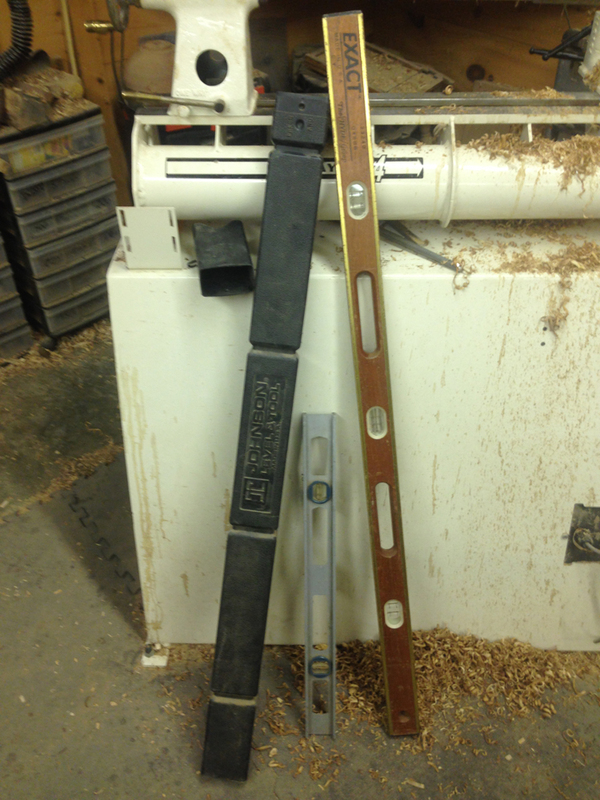 You and I have used that level back-and-forth so many times over the years, and each time I pull it from its plastic case, I remember you and how it came to be part of my tool collection, expanding on the 2’ level I used before. The next year I believe you gave me a new set of socket wrenches, always a well appreciated and useful gift. This one was particularly welcome because it had the sockets for the 1?2” and 7/8” sizes that I had not realized were missing from my existing socket set the last time you used it. In the following ten or so years I believe you gave me about three other new socket sets, sometimes instead of bringing back the set you borrowed and sometimes treating it as a trade “up” for me. You have always been considerate about seeing that one of us has a complete set when you need it. The big year, about the time you were fifteen, you captured your mother’s agreement with your enthusiasm and bought me that 8 1?4” Hitachi compound miter saw. What a wonderful gift. You and your mother were so proud; I was cautiously delighted because I knew that I would love it but uncertain about who would be paying for it. No real surprise when it showed up on your mother’s credit card bill as a major purchase the following month, yikes! 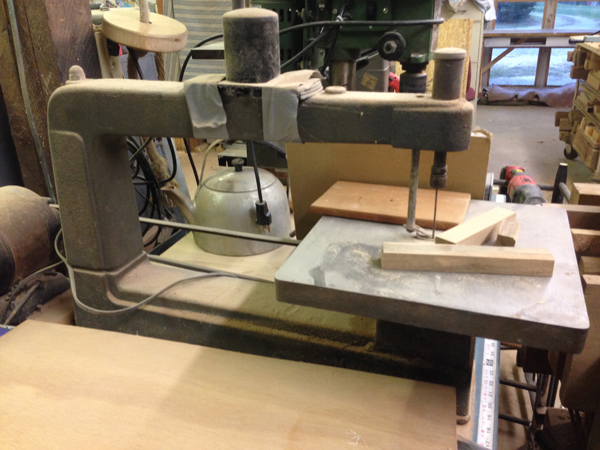 But truthfully we have both used and enjoyed that saw over the past twenty or so years. I hope you enjoyed the newly sharpened blades you found on it each time you borrowed it. I do appreciate you bringing it back so readily without prodding just in time for another newly sharpened blade. One Christmas from that earlier time stands out from all the rest and epitomizes the core of my subsequent New Year’s resolutions in the shop. It all started when I asked your mother to please not give me any gifts that cost money and especially to not give me any gifts that you might suggest because frankly I could not afford anything that I “did not realize” I needed for the shop. Instead, I requested that she give me the gift of time – time alone, undisturbed, uninterrupted, left to myself to work in the shop after the Christmas holiday in the lull of the New Year. That is exactly what she gave me that year – one day of uninterrupted time to work in the shop all by myself. What a spectacular gift — no surprise credit card or lumberyard billing expenses, no new tools (however welcome) to feel guilty about, and no guilt about not doing some of the other “fun” family things that would usually accompany an holiday vacation. Building on the success of that your mother expanded her gift to me of two or three days in the shop undisturbed. If someone called on the telephone for me, she would tell them I was “away” and would call back when I returned. Eventually the gift turned into a full week. You might remember the year she gave me a “sabbatical” in mid-February when everyone else was at work and you and your brothers were in school. My plan that year was to teach myself to build a Windsor chair from Mike Dunbar’s excellent book. I subsequently wrote up a diary account of the week that I shared with you boys and your mother. What a wonderful woman she was to understand how much I wanted that time to explore, learn, experiment, and grow on my own. This year in her honor I ordered the package of carving goodies from Highland Woodworking for Christmas. Having spent nearly all of my time over the past forty-five years turning wood, I will use this year’s gift of time to improve my stationary carving skills by setting aside three days in early January to work my way through Mike Davies’s lessons and practice with a goal of adding significant hand carving to my skill set on both turned and fixed pieces, a personal goal that will reward me many times over. My son, you and I have enriched our lives by sharing our tools and projects over the years. The fun of planning and mutually rationalizing our need for this or that new tool or piece of equipment has remained the outward and visible sign of our inward passion for taking on new challenges, developing new skills, and talking to each other about them. While it has been years since you had access to your mother’s credit card and easy access to my shop, our relationship continues and I am deeply appreciative of the new trailer you built for me several years ago as well as the old plow truck you fabricated the hydraulic hoist on for me. I still use that hoist lifting woodturning logs when I am not close enough to use the tractor-loader you fabricated from various machines and so proudly delivered to me last year. 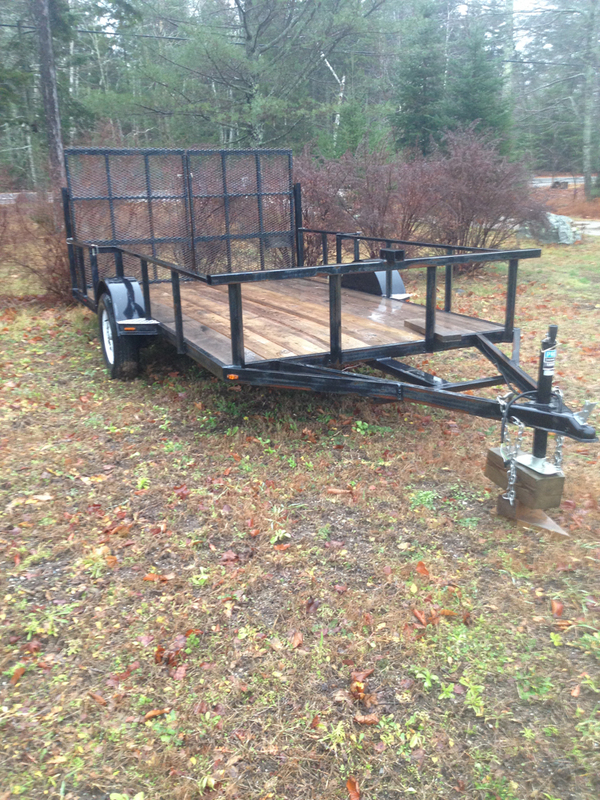 Well-equipped for my new adventures in the wilds of mid-coast Maine, I am blessed by your talent, design and welding skills, and devotion. I definitely love my customized turning tools and equipment you have made for me for their intrinsic value as well as for the deeper meaning of your thoughtful sensitivity and practical understanding of me, of my own goals, and of my passion for work. My RESOLUTION for 2016 is to share the discovery with you that I made about twenty-five years ago when your mother gave me the “gift of time.” For your 39th birthday and each year going forward, I will solve the question of how to give you something personally valuable by giving you the remarkable “gift of time” to explore some new passion of your own in your shop or in a class. Part of the gift might be a Christmas pre-birthday teaser tool or encouragement to push you to figure out when and how to best use your new opportunity – a “wish-list of New Year’s resolutions.” I will give you two days of matched pay from your job so you can take those days “off” without losing from your paycheck or vacation benefits to fund the time you spend plus tuition and/or tool expenses. I encourage you to make some kind of report back – written, audio, or personal visit – with a summary of your project for your family, your brothers, and for me. In this way I hope to perpetuate in our family that spontaneous but unexpectedly wonderful gift your mother gave me so many years ago. Time and encouragement to learn and grow as an artist, a craftsman, and a spiritual being. During the Christmas season of 1967, about two months after the late October school event where I met and began dating my girlfriend (later my wife), she told me that her mother wanted a list of what I might like to receive for Christmas. Pleased with this affirmation of my growing membership to this new family, I thought this a splendid idea (the nineteen-year-old). I also realized I should handle this with diplomatic sensitivity to avoid creating an undesirable impression (the college freshman in me). 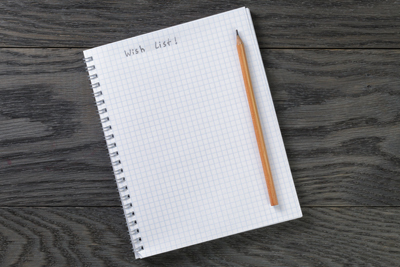 In my own family experience, my siblings and I often laughed about the reality that whenever any of us gave our mother a wish list of presents we might want for Christmas, we were pretty well guaranteed to never receive those items. True fact. The tradition in my new girlfriend’s family turned out to be quite different. When a person in her family put an item on the Christmas wish list, that person was guaranteed to receive it. If the list had five items, that lucky, and in my case totally humbled, person received everything on the list! Imagine my surprise, embarrassment, and delight (quite a complex set of feelings) when I visited my girlfriend and her mother that Christmas morning and discovered all of my carefully planned Christmas wishes in beautifully wrapped packages that I unwrapped one after the other. That Christmas was a turning point for me. 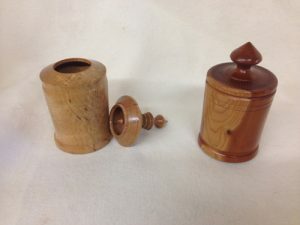 In a lasting way, because of my MIL and late wife, I discovered the lathe and rewards of woodturning, a passionate pursuit for me that continues. I ultimately learned through trial and error to enjoy the crisp benefit of a well-sharpened saw and chisels cutting clean well-measured dovetails. In a larger perspective I grew to enjoy having the right tool to accomplish the job efficiently and effectively. As I think about the many years and projects since that Christmas, I grow in my appreciation of my mother-in-law’s confidence and support for my passion for shaping and cutting wood. Reflecting on her life and on my late wife’s gentle but firm guidance that urged me to seek excellence, I look again to see how that original whimsical and uninformed list of new tools would stack up this year for my wish list. Isomax 100 Piece Security & Standard Screwdriver Tips — $34.99. Of course there are many more screw types 48 years later, and a set of driver tips to fit a screw of nearly every type fulfills that shop urge to meet every possible need with just the right tool, not to mention the ubiquitous dependence on the cordless driver (which outstanding engineering I would also like to include). This extensive set seems to cover every possibility for any occasion, which is an admirable goal for every on-call fixit person. Bad Axe Stiletto Dovetail Saw – 12 inch — $245.00. For those of us who value the sensual and spiritual pleasure of cutting and fitting dovetails by hand, this is the kind of tool that challenges the craftsman to work always at a challenge level of excellence. Magically the higher level of the artistic beauty of the tool itself energizes and inspires the craftsperson to new levels of achievement. Narex Premium 6-Piece Bench Chisel Set with Leather Tool Roll – $119.99. What a beautiful presentation these fine chisels properly make in a properly protected roll, and complimentary they are for use on fine furniture. I believe this set might make the best kind of gift for my oldest son who builds wooden boats at Brooklin Boatyard in Maine, a fitting connection between the encouragement from his grandmother long before he was born and now when he does such beautiful work on the impressive new boats such as Foggy being designed and built at the yard. Rikon 70-220VSR 12 ½” Midi Lathe – (on sale!) 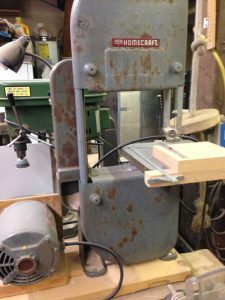 $599.99 This represents a tremendous advance over that tiny little Toastmaster multi-tool combination lathe, saber saw, and sander with which I first ground out a little goblet from a pine blank with one scraping tool in January of 1968. What a terrific starter machine with versatility and stability that will launch novice woodturners into that wonderful world of expression in craft and art. I think asking for the lathe I really want, the Oneway 2436 3HP Lathe at $6,481.00 plus freight might have been a little ambitious after only two months of dating, but then again, if I did not ask, she might not have known what I really want. Those Oneway’s are truly beautiful tools in all sizes with precision, safety, well-balanced fixtures that inspire a woodturner to seek excellence, and a powerful launch into a new adventure of exploration, skill-development, passion, and personal development that may never be equaled. The end of the story is that the wife of one of my woodturning students (both extremely good friends) called me to ask if she really needed to take the plunge and if so which lathe did I recommend she buy for her husband’s 25th wedding anniversary, birthday, and Christmas. She said she was sitting down and ready to take the plunge. I gave her the link. 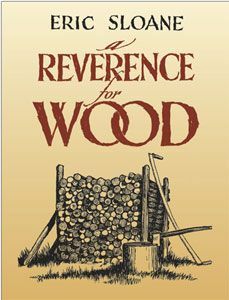 Editors Note: This is a continuation of Temple Blackwood’s article from the November 2014 issue of The Highland Woodturner, which you can read by CLICKING HERE. 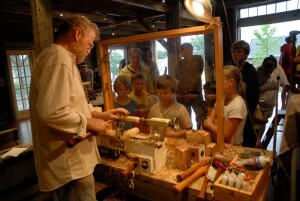 I encourage you to engage in doing regular demonstrations as part of your woodturning service to others, both organizations and individuals, because you will ultimately gain in skill, confidence, knowledge, and reputation. Selecting something like a belaying pin or mini-baseball bat challenges you as a woodturner, while bringing that delightful understanding and surprise to the children of all ages in your audience.